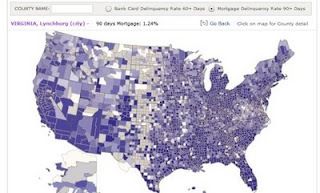 The Federal Reserve of New York's site has a page with a dynamic map of the U.S. showing mortgage and bank card delinquency rates per county. The map shows the % of people with bank cards that are 60 days past due and mortgages that are 90% past due. For example you can hover over Southern Nevada and see that Clark county (Las Vegas) has a 6% delinquency rate on mortgages and then compare that to King county (Seattle) in Washington state and see that their delinquency rate is 1%.